Working dogs are used to help humans with their activities some working dogs are bred specifically for producing other working dogs. In rural sports, most working dogs are used for hunting purposes but Gun dogs and hunting dogs aren't the only types of working dogs. There are other types of working dogs like sheepdogs. Sheep dogs are probably the type of herding dog that will first spring to mind but they are just one type. 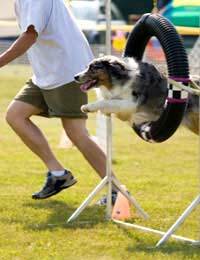 Herding dogs are trained to be able to round up herds of sheep, although some breeds have physical characteristics (like speed and agility) that make them naturally inclined to do this and so don't need specific training. They can round up a variety of different livestock, but most of the herding dogs in the UK round up sheep or poultry. Herding dogs are either heelers or headers. Heelers gently tug at the back of the animal's heels to encourage them to keep moving forwards, whereas headers position themselves in front of the animals to 'stare them out'. As their name suggests, these dogs have the role of protecting livestock. Most of the time the livestock in question are sheep, but this isn't always the case. Whereas herding dogs make it their business to cajole and force the animals to flock together, livestock guarding dogs immerse themselves in the pack and keep an eye out for potential predators. The animals will often congregate around the dog to keep themselves safe. They are often well acquainted with the livestock from when they are young so that the animals will be used to them by the time they're big enough to be their guardians. It stands to reason that if a dog has spent much of its life being around sheep and working with them closely, he or she is unlikely to be anything more than adequate with other forms of livestock, simply because they're not used to them. Working dogs can be bred with other types and breeds of dog that are loyal and affectionate to produce the kind of dog that is widely sought after as family pets. However, even if they're kept as pets, working dogs still need lots of care – probably more so than other dogs as they need lots of physical activity due to their natural characteristics. This obviously makes them unsuitable pets for people who can't take them for lots of walks. It's a good idea to keep them occupied with things like dogs shows, obedience training and dog trials. If they don't get enough physical activity, working dogs are prone to getting restless and uneasy. This then has a knock-on effect on their behaviour, which can become aggressive, noisy and boisterous. Gun dogs and hunting dogs aren't the only types of working dogs. Many other working dogs are used for herding livestock like sheep, or for protecting livestock from predators. Working dogs are used for many other purposes too, but these are two of their main roles in rural areas.